Elements – The Awakening is a brilliant online video slot machine game from Net Entertainment that has been a sensational hit to numerous slot players since it was launched on December 2012. Hundreds to thousands of people all around the world are claiming that they truly enjoy playing this astonishing online game. This video slot game has 5 reels and 20 pay lines. The theme of Elements – The Awakening is centered on the basic elements that are essential in our world – fire, earth, air and water. 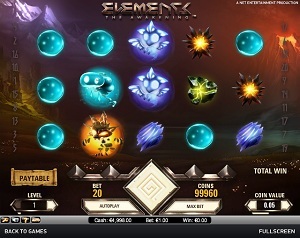 Slightly different from usual slot games, when you “spin” the reels on Elements – The Awakening slot game, instead of spinning, the icons tend to fall down. Whenever you hit a win, the icons involved in that win will be eliminated, and the space that is left by them gets filled up with more new icons that seem to fall down from the sky, courtesy of the game’s Avalanche feature. This means that you can get multiple wins in just a single spin! If you get 4 Avalanches (4 wins from 1 spin) in a row, then you will be transported to one of four Free Fall rounds (water, fire, earth and air) wherein you can get free spins. The concept is so cleverly implemented that it is worth seeing for yourself! Another thing that slot players really love about Net Entertainment online slot games is that they can play the game instantly, and they are not required to download anything! No matter which element you like most (water, fire, air or earth), you will surely love all of them when you play Elements – The Awakening as you get to experience an entirely unique slot game, you can win up to 300,000 coins, you can get Free Spins, the maximum jackpot in coins is 15,000, the maximum jackpot in cash is $7,500, and it also has 4 unique Free Fall bonus games with elemental (air, fire, water, earth) Storm Wilds, each with their own specific bonus features. Elements: The Awakening online video slot game is one of Net Entertainment’s latest creation; thus, you are guaranteed to see spectacular graphics and wonderful sounds in this one. Elements: The Awakening, it seems like the title suggests that the elements (fire, earth, air and water) can be magically awakened and become living creatures. In the game, you can see that each of the elements have their own unique symbol, and a matching elemental character that has eye sockets and are animatedly moving. In the regular Elements: The Awakening slot game, the background is of a minimalist style which does not strain the eyes and it displays the possible origins of each element in our world: the icy mountains (air), the volcano (fire), the rocky canyon (earth), and a lake (water). The symbols are drawn beautifully and you would find yourself mesmerized and you may even stop playing for a bit just to see them do their rather cute moves. The overall graphic design of Elements: The Awakening displays a wide array of colors: black, green, blue, purple, yellow, orange and red. As for the sound, Elements – The Awakening has a very relaxing and serene background sound, and its other sound effects resemble those that you hear in adventure-themed movies. When you spin the reels, you will hear a gust of wind as the symbols fall; and whenever you hit a win, you will hear lightning and booming sounds as you see your wins are added up to your total! In the Elements – The Awakening slot game, there are no card deck symbols available here. Instead, the symbols that you will see here represent the four elements of fire, earth, air and water, and they also have cute elemental character icons that you see in arcade games. The air icon looks like Spyro the Dragon; the earth icon looks like Steelix (with hands) from the Japanese anime Pokemon; the fire icon looks like a spiky-headed cat; while the water icon resembles Weebo from the movie, Flubber. There are 4 Wild Symbols in this game, each named after the elements: fire, earth, air and water storm. In the main game, the Wild symbols only appear on reels 2, 3, 4 and 5; and substitute for all symbols and in Free Falls. There is no Scatter Symbol in this slot game; but, you can still get free spins from their unique and fun Bonus Feature game. The spin icon on this slot game is shaped like a diamond, which is actually quite unique, considering Net Entertainment slot games usually have a round spin icon. The shape of this icon is actually a functional one and it plays an important role because each Avalanche will fill the Energy Meter that is contained inside it. The colors displayed on the meter correspond with the winning combinations that are formed during the Avalanches. When filled, it will activate the Bonus Feature games with one of the following special features: Fire, Air, Earth, or Water Storm Wilds. In the main game, the Avalanche Meter increases by one for each successive fall containing at least 1 bet line win, up to a max of 4 Avalanches. The colors that are displayed on the Avalanche Meter match the element that is leading in the current round. You will see an element Energy Meter which shows the leading element. The section of the Energy meter with the highest energy specifies which Free Falls mode is entered if the Free Falls is activated. The Energy Meter has 4 sections, one for each element, which fills up after winning a bet line. Each and every new game round begins with an empty Energy Meter. If there are 4 or more consecutive Avalanches in a game round that appears anywhere on the reels, one of the Free Fall modes will be activated. Each Free Fall mode rewards you with 10 Free Falls. • Fire Storm Wild: The Fire Storm Wild symbols only appear on reels 2, 3, and 4 in Fire Storm mode and can expand to include reels 1 and 5. Fire Storm Wild symbols can spread in any direction on the reels, changing any two adjacent symbols into Wild symbols for the chance o getting bigger wins. • Air Storm Wild: Two Air Storm Wild symbols fall randomly on the reels in the first Free Fall and stay there on the reels for the whole Air Storm mode. After the first fall, the Wild symbols randomly move to an adjacent position on the reels for each Avalanche or fall. • Earth Storm Wild: Earth Storm Wild symbols only appear on reels 2, 3 and 4 in Earth Storm mode. Each Storm Wild symbols stay on the reels until they have been included in 1 or more wining bet lines, in 3 Avalanches, or when there are no more wins. • Water Storm Wild: Water Storm Wild symbols only appear on reels 2, 3 and 4 in Water Storm mode. The Water Storm Wild is actually an Expanding Wild and it expands vertically to cover the whole reel, changing symbols into Wild symbols. When the Free Falls mode is over, the total win is added to any wins from the round that activated the Free Falls. Elements - The Awakening has 5 reels where you may bet on 20 pay lines. The minimum bet is 0.01 coins and the maximum bet is 0.50 coins per line. Playing online video slots is more fun and easy when there is an Autoplay function available. With its Autoplay function, Elements – The Awakening can be automatically played as complex or as simple as you want it to be. In its simple settings, you can quickly choose from 10, 25, 50 or 75 auto spins which play with the use of your preset bet. If you would like to try it out, tweak the Advanced Settings wherein you can play and “Stop” each time: you win, you get free spins, or you get free falls, etc. After fine tuning the Advanced Settings, simply click the Start button and the game will automatically play for you.